It seems like the mala craze isn’t going to be ending anytime soon. In fact, this seems to be increasing in popularity among the Muslim population too. 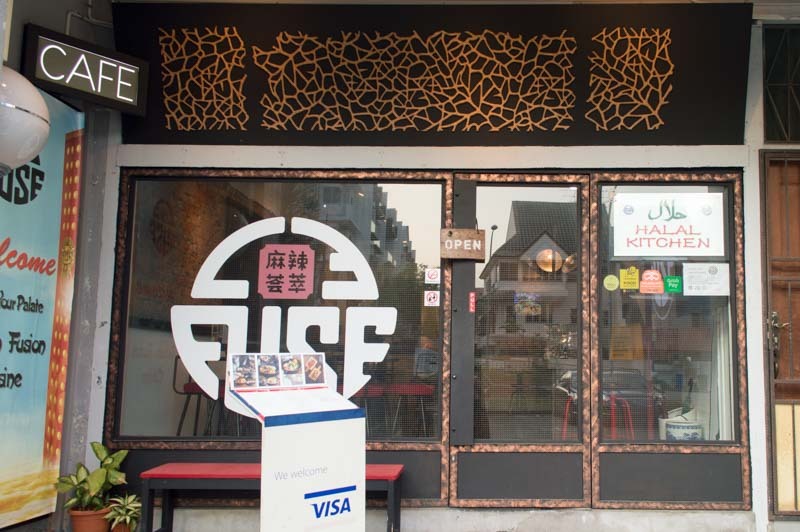 Le Fuse Cafe located along Upper Serangoon Road is one of the first Muslim-owned mala stores in Singapore. 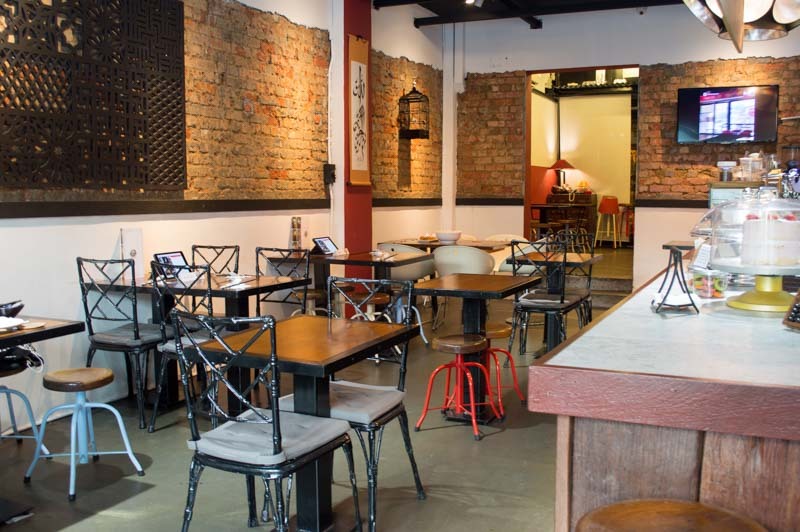 The owners, Mr Leo and Ms Hann created Le Fuse Cafe to prove that Muslims can make authentic Chinese cuisine too. Le Fuse Cafe made me think of a chic Chinese home. The tables were coloured red for good luck and each table is named after a popular city or landmark in China. Their private dining area is even called the Forbidden City! 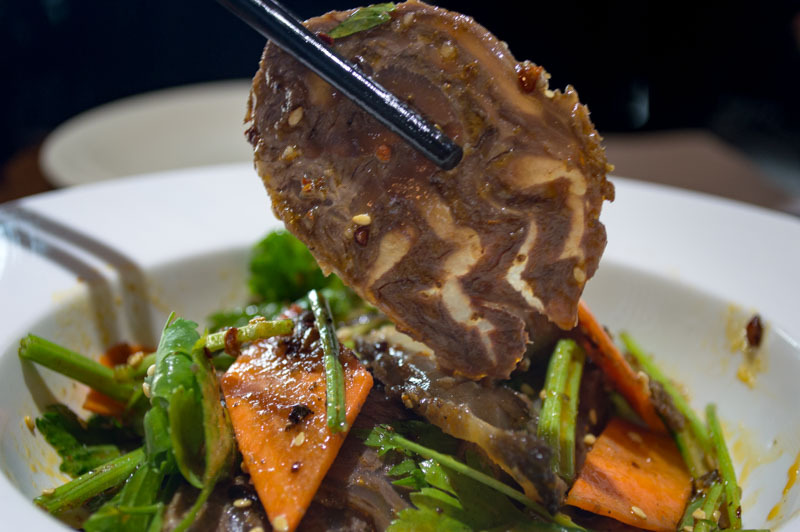 We started with the Fu Qi Beef and Tripe 夫妻肺片 (S$10.80), a cold appetiser. 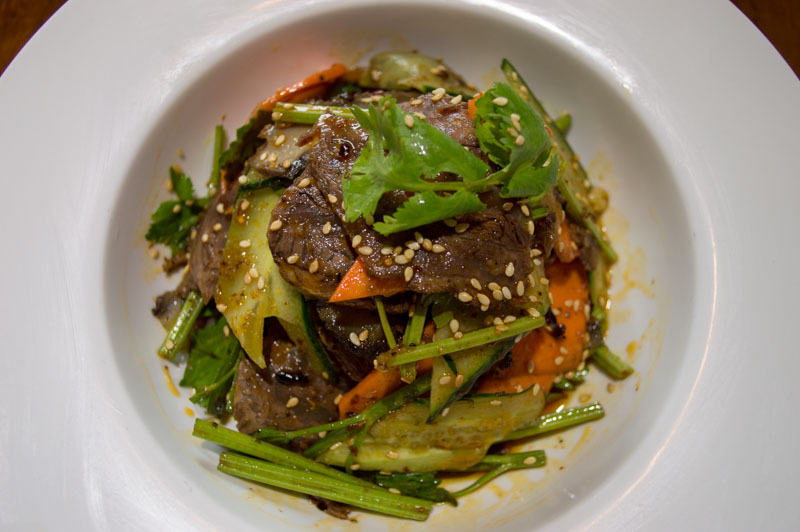 This dish was layered with vegetables such as carrots, cucumber, and red chilli to make the dish more colourful. Peppercorns specifically imported from Chong Qing, China are used in the seasoning. I could see the alternating layers of fats and meat in the thinly-sliced beef. Once I bit into it, the numbing effects from the peppercorns began to cause my tongue to tingle. Perfect for mala lovers! We also tried their best seller, Chong Qing Diced Chicken 重庆辣子鸡 (S$12.80). Traditionally known as the “poor man’s dish”, where peasants in the past used left-over bones from the upper class, deep fry them and turned it into a dish. Of course, Le Fuse Cafe deep fries chicken meat instead, so that each bite was juicy yet crispy. Despite a large number of dried chillis that are cooked with the chicken, the spiciness was still quite mild. The chicken was seasoned with 15 different spices which made it fragrant and slightly savoury, even helping to open up my appetite. The 15 spices were part of a secret recipe, and we could definitely taste some cumin, garlic, peppercorn in it. Ma La Tang Soup 麻辣汤 (S$12.80/medium, S$15.80/large) is a well-known dish, which started the mala mania in Singapore. Traditionally, the Chinese make either a dry or soup-based mala pot with leftover ingredients so that there is minimal food wastage. The owners suggested that this dish is like mala rojak. Le Fuse Cafe’s mala soup differs from the other mala stores as diners don’t get to pick the ingredients. 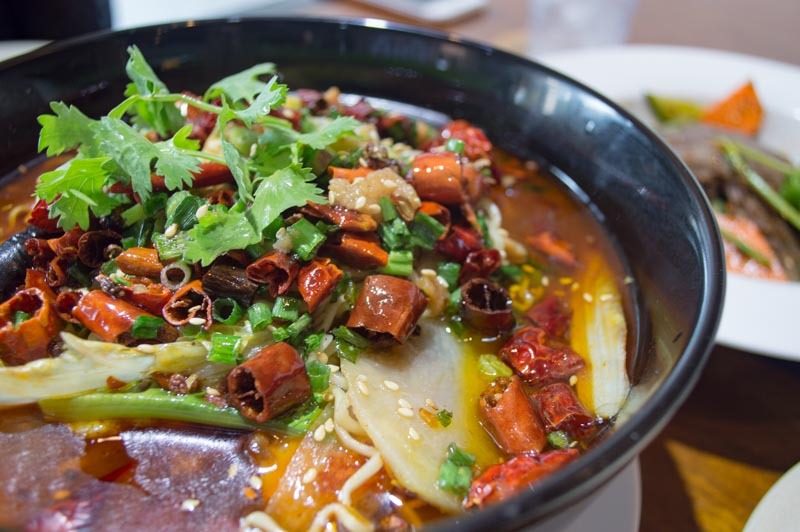 After choosing between soup or dry mala pot, they can pick from three different spice levels available: Mild (Level 1), Medium (Level 2) or Extra Spicy (Level 3). Every pot comes with fixed ingredients, such as cabbage, lotus roots, potatoes, and broccoli which absorbs the soup. For meat lovers, Le Fuse Cafe also adds chicken franks and chicken ham into the pot. 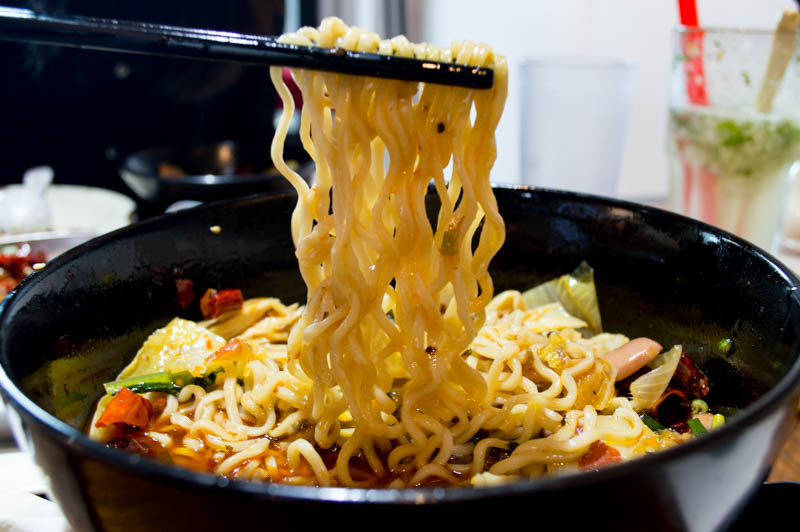 You can also add either plain rice or instant noodles into the soup, and of course, we chose instant noodles. Since we had the Mild soup, it was not as numbing as I thought it would be, but the heat built up with every mouthful. 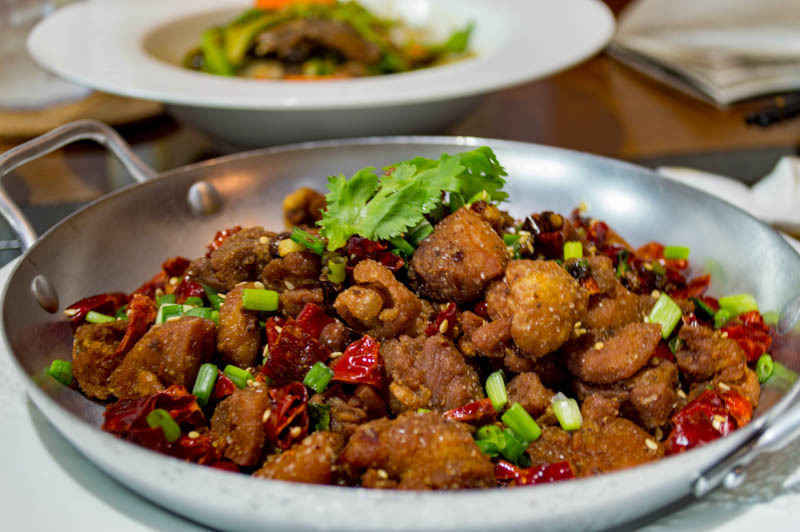 Every Chinese place has a duck dish and of course, Le Fuse Cafe is no exception. 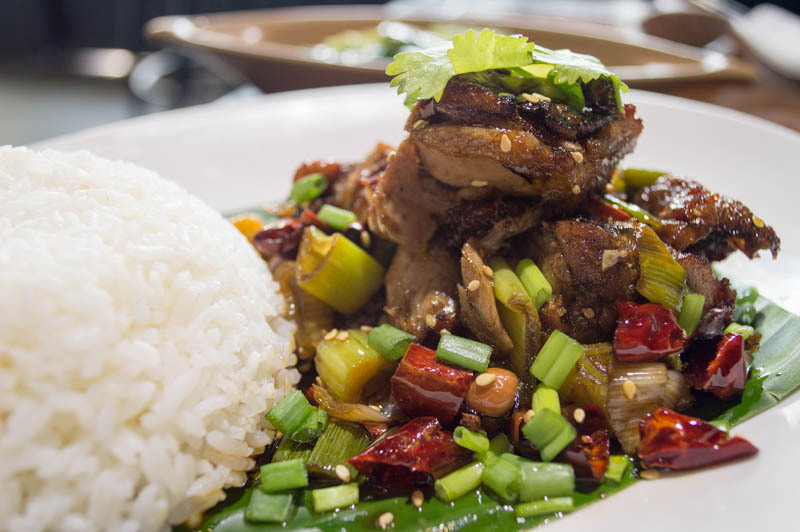 The Sichuan Duck Rice 四川鸭饭 (S$12.90) is their premium speciality dish, and comes with a side of garlic and cucumber. Le Fuse Cafe braised the ducks so that it is crispy on the outside but soft and succulent on the inside. We had the duck with the plain rice, which helped to balance out the rich flavours of the fat and melted easily onto my tongue. The crunchy cucumber side dish is a refreshing change from the other dishes, as it didn’t have any chilli in it. If you like sour dishes like me, the garlicky and biting taste of the dish will cleanse your palate. For those who just want a good cup of coffee or a snack break, you can enjoy your coffee with some homemade baked goods by Ms Hann at Le Fuse Cafe too. And for the rest of you mala lovers spread the word to your Muslim friends and family and enjoy an authentic mala meal together!